NDSU › Publications › Crops / A Basic Primer on Biotechnology / Figure 4. 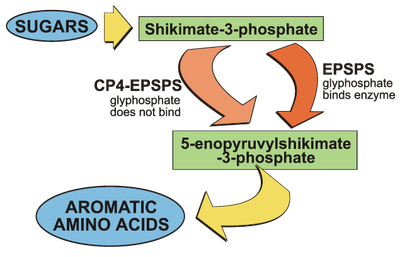 In the Shikimate pathway, lyphosate binds the EPSPS enzyme. Plants with the transgene that codes for CP4-EPSPS function normally because glyphosate does not bind the CP4-EPSPS form.